The next-gen Hyundai Verna, the most anticipated mid-sized Sedan has recently been launched in India on 22nd August 2017. The feature-packed 2017 Verna from the South Korean automaker has been introduced in a bid to attain supremacy in the segment, which is currently topped by the Maruti Suzuki Ciaz and Honda City. The new launch from the Hyundai will witness a three way battle between these rivals, which will take the competition to the next level in the segment. Hyundai is settling to further strengthen its position in the market by launching eight more products in its line-up by the end of 2020. India is one of the most dynamic markets for the mid-sized Sedans, which has witnessed a great evolution over the years in the segment. It is among the most competitive segments in India, where manufacturers come every now and then with new launches featuring new ideas and concepts to further consolidate their position in the market. The 2017 Hyundai Verna is a facelifted version of the previous model and even before its launch, it has created a lot of buzz among the people. 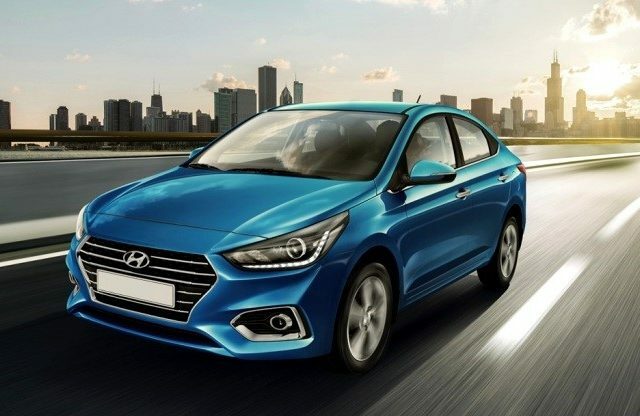 Until now, the Verna lineup has been the best-selling sedan from the manufacturer, and the latest version features a fresh look with more comfort and better features. The car has been getting animmense appreciation for the new Fluidic design concept used for the styling. It is an absolute eye-catcher, which flaunts its exterior aesthetics with a sporty look and promises to offer much more than before on every front. The car is already launched and the booking is on the cards. So, before you purchase the most-awaited mid-sized Sedan, here we provide alist of top five Hyundai Verna features of the car you must know. The latest sedan from Hyundai is built on the all new K2 platform, which also underpins the elder sibling Elantra. The car sports styling changes with the new Fluidic design philosophy of Hyundai, which gives it a fresh and modern look to boast off. The front-end of the model features Hyundai’s traditional Chrome Cascade grille and Projector headlamps with daytime running LED lights. It also gets pentagonal LED fog lamps in the centre of the sculpted bonnet. The side profile of the new car packs curves and creases at the right places to look more elegant. The roofline is sloping in nature to provide a coup-ish design to the car. The rear-end comes with LED tail lamps cluster and dual tone bumper. The top-end variants will run on the 5-spoke 16-inch diamond-cut alloy wheels, while the base models will sport 15-inch silver wheels. The interior of the new Verna comes with a premium look along with some of the first-in-segment features. The cabin is highly finished in dual-tone black and beige colour theme. The exceptional feature of the car includes ventilated front seats and electric sunroof. The newly designed dashboard features a 7.0-inch touchscreen infotainment system, which is compatible with Apple CarPlay, Android Auto and Mirrorlink. The infotainment system features advanced Audio-Video Navigation (AVN) system with reverse parking camera. Other standard features include Bluetooth, USB, six airbags, ABS, ISOFIX, keyless entry, cruise and traction control. The new Verna offers the same set of power mechanism under the hood, sporting both the petrol and diesel variant option. The petrol unit derives its power from a 1.6-litre Gamma Dual VTVT engine, which can generate a maximum power output of 121 bhp at 6,400 revolutions per minute and a peak torque of 151 Nm at 4,850 revolutions per minute. On the other hand, the diesel variant features a 1.6-litre U2 CRDi engine which churns out a maximum power of 126 bhp at 4,000 revolutions per minute against a peak torque of 260 Nm at 3,000 revolutions per minute. Both the engines come paired to either a 6-speed automatic or a 6-speed manual gearbox to transfer the power to the front wheels. The new Hyundai Verna has been offered in four different trim levels – E, EX, SX, SX (O). The base variant will be E, while SX (O) is the top-end variant. The base variant E will feature ABS with EBD, dual airbags, central locking, clutch lock, rear view mirror, Immobilizer, ISOFIX child seat anchors, dual horn, dual tone Beige & Black interior and fabric seat cover. The next level variant EX will receive reverse parking camera, automatic headlamps, USB charger and a 5.0-inch touchscreen audio system. The SX trim will feature a 7.0-inch infotainment system compatible to Android Auto and Apple CarPlay, leather wrapped steering wheel and electric sunroof in addition. Finally, the top-end variant SX(O) will additionally come with some best-in-segment features including 6 airbags, smart key, chrome outside door handles, adjustable rear seat headrests, leather seats, ventilated seats and rear curtain. All the variants will be offered in four new shades – Fiery Red, Flame Orange, Sienna Brown and Polar White, while the regular paint schemes will include – Phantom Black, Stardust and Sleek Silver. The new generation Hyundai Verna is priced slightly on the higher-end from its predecessor starting from Rs. 8 lakh (ex-showroom, Delhi) for the base variants and goes up to Rs. 12.62 lakh (ex-showroom, Delhi) for the top-end trims. Once launched it will directly face the rivals like Maruti Ciaz, Honda City, VW Vento and Skoda Rapid in the C-segment of Sedan in the Indian market. The facelifted version of the Hyundai Verna is launched in India and scores heavily on paper to be a strong competitor for the segment toppers like the Maruti Ciaz and the Honda City. It will be a great competition to be witnessed, as the segment toppers would not easily pass on its glory to the new launch and will further come up with new ideas and concepts to make the segment more competitive. But, looking at the way new Verna is designed and the latest features it offers, one can surely predict for the model to stay in competition for a long time. Moreover, the competitive price offered is highly appreciated for the value it gives back.